Athletic Bilbao goalkeeper Alex Remiro "has no serious injury" after being rushed to hospital following an incident in training. The 21-year-old, who is yet to make his debut for the La Liga side, was hit on the head by a ball on Wednesday. 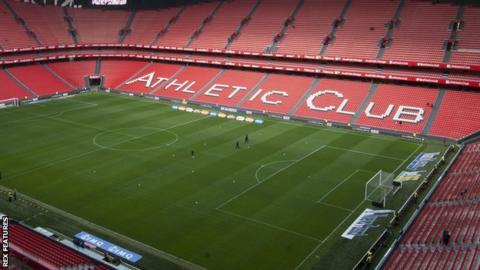 "The tests carried out (radiography, scans) have not revealed any significant injury," Athletic said in a statement. "It is expected the player will remain under observation in the coming hours." Remiro, who recently returned from a loan spell with second-tier side Levante, is Athletic's third-choice keeper and has been capped at under-19 level by Spain. "Thank you to everyone for your messages of support. I will soon be fighting back on the pitch," Remiro tweeted.